We demand much of our feet every day. They support all the weight of our body as we go about our daily activities. It’s no wonder that sometimes, at the end of the day, our feet are sore. Your feet shouldn’t hurt all the time, though. You shouldn’t have to suffer through foot pain or limit your activities because pain is holding you back. If you have foot pain, consider using Custom Made Arch Supports. Often, these devices are able to significantly relieve pain by providing your feet with the extra support that they need. The name sounds fancy, but Custom Arch Supports are based on a pretty simple idea. They are customized devices that can be made from a variety of materials e.g plastic, gel, or foam, depending on your individual needs & are made specifically to fit your feet. When you order them, moulds , or scanned images will be taken of your feet so that the Custom Arch Supports can be made to fit you perfectly. 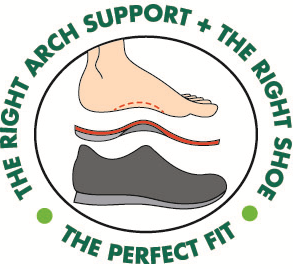 The Custom Arch Supports serve to provide extra support wherever you need it, such as in the arches of your feet. These devices also help to balance out abnormalities in the gait. Typically, a gait analysis will be performed first, which allows the examiner to identify any abnormalities. Then the feet will be cast or scanned, so that you end up with a perfectly moulded pair of Custom Arch Supports that can be inserted into your shoes. You may have seen shoe inserts or arch supports for sale in pharmacies etc. These are similar in appearance to Custom Arch Supports. However, there are major differences in terms of application. The shoe inserts that you see in pharmacies are made in one general mould. Often, they have to be trimmed to fit your feet. These inserts are not made specifically for your feet, so they likely won’t give you support in quite the right place where you need it. Custom Arch Supports, on the other hand, are made specifically to fit your feet perfectly. Who Can Benefit from Custom Arch Supports? Custom Arch Supports can benefit people who suffer from many different types of foot conditions. Plantar fasciitis is a common foot condition that can be improved through the use of Custom Arch Supports. The name plantar fasciitis refers to the plantar fascia, which is the ligament that connects the heel to the toes and provides support to the foot’s arch. When the plantar fascia becomes strained or inflamed, it can cause pain, weakness, and swelling in the heels. Typically, plantar fasciitis develops slowly, over an extended period of time. This is because the inflammation of the plantar fascia occurs over time. When the plantar fascia is stretched or strained, tiny little tears form in it. Normally, those tears would heal on their own. However, when a person participates in a repetitive activity, like running, the plantar fascia is continually aggravated. The constant assault on the plantar fascia prevents it from healing normally. Custom Arch Supports can also help with hammertoes and bunions. Hammertoes can be recognized by an abnormal bend in the joint of the toe. It can occur in just one of the toes, or multiple toes. It can be painful to move the toes that are affected, and corns or calluses can develop there. Bunions are abnormal growths of bone on the toe that occur near the base of the big toe, at the joint. Custom Arch Supports can also benefit athletes and anyone who experiences frequent foot pain. If you are tired of foot pain, get in touch with Foot Solutions. The experts at Foot Solutions can perform a gait analysis and fit you with Custom Arch Supports ( custom orthotic inserts ) for your shoes.